At the turn of the 20th century Admiral George Dewey, Pacific naval commander, became a veritable American hero for his role in the Spanish-American war. While United States foreign policy was focused on global expansion, not everyone believed it was a good idea. The Philippines, certainly, were not keen on U.S. imperialism and continued to fight for control of the country until 1902 (Spain “awarded” the Philippines to the United States for $20 million under the 1898 Treaty of Paris). 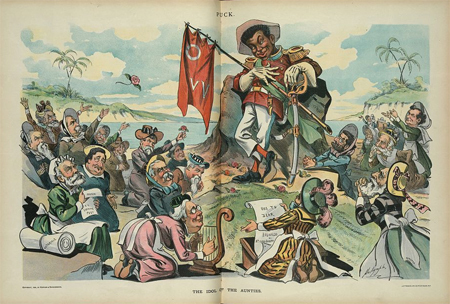 Use the political cartoon primary source set below (as well as the cartoon above) to consider how the political magazine Puck portrayed different U.S. perspectives of expansionism from 1899-1902 in relation to the Philippines. Use the accompanying resources to help inform and guide student analyses. You may choose to have students analyze the cartoons twice, first without reviewing the bibliographic record or any other texts and again after the review of these records and materials. Look to the Common Core State Standards alignments below to inform additional activity tasks. Focus Question How did U.S. national interests impact Philippine liberty and democracy around the turn of the 20th century? RH.6-8.10. By the end of grade 8, read and comprehend history/social studies texts in the grades 6–8 text complexity band independently and proficiently. RH.9-10.1. Cite specific textual evidence to support analysis of primary and secondary sources, attending to such features as the date and origin of the information. RH.9-10.3. Analyze in detail a series of events described in a text; determine whether earlier events caused later ones or simply preceded them. RH.9-10.4. Determine the meaning of words and phrases as they are used in a text, including vocabulary describing political, social, or economic aspects of history/social science. RH.9-10.6. Compare the point of view of two or more authors for how they treat the same or similar topics, including which details they include and emphasize in their respective accounts. RH.9-10.8. Assess the extent to which the reasoning and evidence in a text support the author’s claims. RH.9-10.9. Compare and contrast treatments of the same topic in several primary and secondary sources. RH.9-10.10. By the end of grade 10, read and comprehend history/social studies texts in the grades 9–10 text complexity band independently and proficiently. RH.11-12.1. Cite specific textual evidence to support analysis of primary and secondary sources, connecting insights gained from specific details to an understanding of the text as a whole. RH.11-12.2. Determine the central ideas or information of a primary or secondary source; provide an accurate summary that makes clear the relationships among the key details and ideas. RH.11-12.3. Evaluate various explanations for actions or events and determine which explanation best accords with textual evidence, acknowledging where the text leaves matters uncertain. RH.11-12.6. Evaluate authors’ differing points of view on the same historical event or issue by assessing the authors’ claims, reasoning, and evidence. RH.11-12.8. Evaluate an author’s premises, claims, and evidence by corroborating or challenging them with other information. RH.11-12.9. Integrate information from diverse sources, both primary and secondary, into a coherent understanding of an idea or event, noting discrepancies among sources. RH.11-12.10. By the end of grade 12, read and comprehend history/social studies texts in the grades 11–CCR text complexity band independently and proficiently.